iNotes Web Access is a next-generation Web client that allows you to use many of the messaging and collaboration features of Domino through a Web browser. You can work with mail, calendar, to do lists, or a journal-like notebook from any client with Web browser access -- without requiring a Lotus Notes client. You also have the option to work offline, without a permanent connection to the Domino server, or to work online seamlessly. iNotes Web Access on the IBM eServer iSeries server is not a platform-specific implementation. At the time when this IBM Redbooks publication was written, only the book "iNotes Web Access Deployment and Administration", SG24-6518, which is based on general platform information, was available. This book extends the topics written in that book from an iSeries server platform perspective. It also includes other general iNotes Web Access topics such as single sign-on, using LDAP for authentication, and URL redirection. You can download the book, "iNotes Web Access Deployment and Administration", SG24-6518, from the IBM Redbooks Web site (http://www.redbooks.ibm.com). You should also refer to the Lotus white paper, "iNotes Web Access Deployment Guide 5.0.9", which is available for download from the Web site (http://notes.net). 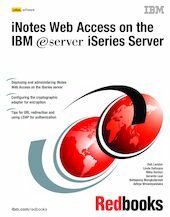 We strongly recommend that you use these materials, along with this book, for a complete guideline on how to deploy and implement iNotes Web Access on the iSeries server.